CME Credit is NOT available for this Module. Think about a teacher you admired. What did he or she do to enhance your learning? How did this great teacher motivate you or inspire you? As a teacher, what are your strengths, and what do you need to work on? What attitudes do you hold about teaching, and about learners, that enhance your effectiveness, or limit it? Ultimately, clinical teaching aims to assist your students to become self-directed, lifelong learners. Teaching is a complex process requiring attention to both the patient and the learner(s), including an accurate diagnosis of the patient’s problems and an accurate diagnosis of learners needs. cultivate self-awareness about your teaching practices. Teaching at the patient’s bedside is an opportunity for effective role modeling, direct observation of learners in action and demonstration of clinical skills. Small group teaching, such as teaching rounds with hospital teams, requires planning, facilitation skills, and use of discrete types of questions. Teaching is at the heart of the medical professions. Much of what we know we have learned from the examples and teachings of our parents, teachers, siblings and friends. When we experience the pleasures of learning, it encourages us to pass along what we have learned to others. Along the way we also learn that teaching is, in many ways, its own reward. Many of us have experienced the gratification of teaching something important to a friend or colleague that makes a difference in their lives. Teaching can be exciting and stimulating when it is going well, connecting us to what we value in our work. Teaching is core to a doctor’s role. In fact, the origin of the word “doctor” comes from the Latin, “docere,” meaning “to teach.” We teach patients about their diseases and how to care for themselves. If we use effective teaching techniques patient understanding, adherence, and outcomes improve. We teach junior colleagues, who then deliver better patient care. Indeed, as we progress in medical education, we are expected to teach, and in preparing for teaching sessions, we often learn new material that helps us as much as the learners. It has been estimated that house staff spend 20% of their time teaching. Even these inexperienced teachers impact learners by their role modeling. All clinical teachers must remain cognizant of the impact that their behaviors and attitudes have on learners. We can enhance our effectiveness as teachers and role models by developing certain attitudes, knowledge, skills and self-reflection. If one of the end products of all clinical teaching is to enhance learners’ clinical reasoning, still we do much more than that in our teaching. Through our manner with learners and patients we model professionalism, including respect, kindness, attention to learners’ and patients’ worries and suffering, and using our abilities to not only diagnose and cure, but to understand and promote healing. The best teachers inspire, and pass along their wisdom and art to contribute and to leave something behind – to enhance the lives of current and future patients, families, and communities. Attitudes shape behaviors. Positive attitudes about teaching and about your learners enhance your effectiveness as a teacher. Attitudes that enhance your teaching include enthusiasm for teaching (1) and patient care, respect for your peers and junior colleagues (2), caring about your learners as people, and concern for their educational needs and for their personal and professional growth. If you believe that your students are basically well-intentioned and trying to do their best, you are more likely to be generous with your praise for their efforts, forgiving of small mistakes and supportive of their stretching their limits. If you believe that your students are lazy and trying to get away with doing as little as possible, don't really care much for what you are teaching, aren't as dedicated as you and your colleagues were, or are not striving for the high standards that are your ideal, you may only see their faults, be stingy with your praise, and generous with your criticism. Positive and negative experiences with teachers help shape our attitudes. For example, some faculty members learned through being "pimped" and humiliated in front of their peers (3), and came to believe that this is an effective way to teach. For most, humiliation inhibits learning. Moods and affective states affect our attitudes. If you are feeling resentful, angry about your personal or professional situation, unfairly treated by your seniors, not good enough or smart enough, or feeling envious or angry towards certain junior colleagues on your team, these negative emotions will surely inhibit your ability to be an effective teacher. A number of faculty members and house staff are burned out or depressed, causing them to have negative attitudes and to be irritable with others. (4) On the other hand, if you are feeling confident, secure in your knowledge and abilities, and can provide positive energy to your rounds and teaching sessions, these emotions will be infectious and contribute to a positive learning environment. It can be worthwhile to ponder and discuss these questions: What are your basic attitudes about yourself and towards your peers and junior colleagues? How confident are you in your sense of yourself as someone who can contribute to others and be a role model to junior colleagues? What do you value about being a teacher? How might your emotional state and your attitudes be enhancing or inhibiting your ability to be an effective teacher? The first step towards improving your effectiveness as a teacher involves self-reflection. Your abilities to teach improve as you grow personally through enhanced self-reflection and self-awareness. It can be helpful to discuss your doubts, fears, concerns and insights with trusted colleagues and friends as a way of promoting your personal growth, as a person and as a teacher. Much has been written in recent years about attending to and improving self-awareness in medical education. Novack, Epstein and their colleagues summarized the issues related to enhancing self-awareness and reflection in medical education and care. (5, 6) Finally, it is worth emphasizing the point about caring for your learners. Peabody (7) famously said that the secret in the care of the patient is in caring for your patient. The same can be said for teaching. If you respect, honor, and care for your learners as individuals, they will know that, forgive small mistakes, and want to learn all the more. Effective clinical teachers understand and employ diverse educational strategies in order to engage and stimulate the intrinsic motivation of their learners. Novack and colleagues summarized educational principles relevant to teaching medical interviewing (8). In the following section, we describe 10 guidelines that apply to teaching in clinical medical settings. Discussion and development of shared goals and objectives at the beginning of rotations as well as the beginning of individual sessions enhances all learning activities. The maxim that if you don't know where you're going it's unlikely you will get there, and you surely will not know if you have arrived, applies to clinical teaching activity. Learners and faculty who share expectations prepare better, stimulate and engage with each other’s needs and can measure progress. In discussion, both learners and teachers may wish to modify objectives or add new ones, according to their learning needs. Interns and residents will learn more in a rotation if they sit down on the first day and agree upon goals, responsibilities, expectations, and what they hope to learn and teach during the rotation. Even when beginning a session to teach a discrete topic, it is helpful to outline the main goals of the session, seek agreement and with your learners, and give them a chance to add other related goals. Please click the video-button on the left and watch how a senior resident orients his team members on the first day of a new service. As a rotation or session begins, assess learners’ knowledge, perspectives and feelings, so that you can address misconceptions and fine tune your teaching strategies. Address learners’ motivation about a session or rotation to maximize their learning. When learners think they fully understand the topic you are working on, they are unlikely to pay close attention. Some learners may have preconceived notions about your topic area, and close their minds to new learning. Sometimes it is helpful to administer a brief pre-test of knowledge, self-efficacy, and attitudes, to assist learners in becoming better aware of their educational needs. Start with the basics, or review the basics when teaching complex concepts and skills. Many concepts and skills that comprise medical practice are quite complex. Students learning the complexities of acute renal failure must first understand acid base balance and the ranges of normal electrolytes. Similarly, skills, including interviewing, physical examination and other procedural skills, rely on learning basic skills first. Members of house staff teams from diverse backgrounds may have had different experiences with learning certain basics. You will often need to assess their familiarity with core concepts and review some basics before teaching advanced topics. Begin your teaching from the level of learner understanding. Clearly describe skills, demonstrate them, and articulate performance standards (anchors). Whether you're teaching simple or complex skills, describe orally and in written handouts the behaviors that comprise them. Demonstrate the skills and articulate performance standards (anchors) that allow learners to assess their progress against those standards. Observe learners as they practice, and teach learners to observe each other and give feedback, using the anchors. Showing brief videos of effective skill performance in a medical context can enhance understanding. Present alternative descriptions of key principles and show multiple examples of important or complex skills. “See one, do one, teach one” is seldom the most effective technique for mastery of skills. Sometimes learners must see complex procedures multiple times before attempting them with expert guidance and repetition until mastery. For behaviors or concepts that are especially important or particularly complex, give multiple examples that shed further light on their utility and execution in varied contexts. Giving feedback shows learners that you are fully engaged, and feedback speeds learning of knowledge and skills. When you give feedback to learners and demonstrate that you can both praise success and help them with deficiencies, you show that you value your teaching role. You build trust and relationship, show your willingness to fully engage, and show that you value their success. Your engagement with learners through your feedback thus individualizes and speeds the learning process. Learn feedback principles and be certain to capitalize on the many opportunities presented to you for using feedback as a teaching tool. (9) In addition to formal feedback sessions, feedback can be used within teaching sessions to facilitate learning for the individual and the group. 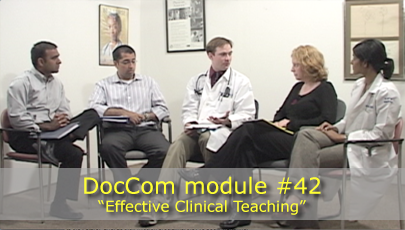 Module 40 presents principles and guidelines and illustrates the process in varied contexts. Ensure that learners can demonstrate knowledge or skill acquisition. When learners experience success in learning, that success enhances their confidence and motivation to continue learning. Establish goals and objectives that most learners will be able to achieve and demonstrate in that session or within a short time. Organize learning activities that provide opportunities to observe and comment on learner successes, perhaps through quizzes, evoking discussion with good questions, skills practice in role play or other simulation. Whether you are teaching new knowledge or new skills, your honest praise to students for their successful learning increases their self-confidence and enjoyment of learning, as well as their regard for you as a teacher. When you respond with empathy to learner expression of reluctance, stress and distress, your sessions can be more effective. The stresses of medical school and residency training can lead to anxiety and demoralization. These and other negative attitudes and emotions, such as feeling inadequate, guilty or lonely, inhibit learning. Monitor the emotional "temperature" of learners. Sometimes group members will seem somber, or stressed, or be reluctant to answer questions. Some learners, especially in the middle of an internship, may be depressed or burned out. (10) Sometimes you as a teacher may be asking too much of your learners or you may have inadvertently said something that left them confused or upset. You create an atmosphere that maximizes learning possibilities when learners know you care and that you understand their feelings. If you ignore, put down or make light of learner distress, you add another obstacle to effective learning. If, on the other hand, you inquire about what people are feeling and show your concern and willingness to try to address some of the issues, you can "clear the air," motivating and preparing your learners. Of course you cannot take responsibility for resolving outside situations, but simply acknowledging their significance reassures learners, freeing them up to participate. Sometimes you learn something as simple as that group members are in the middle of major tests, or boards. You further enhance engagement and motivation when you provide encouragement and emotional support in a non-judgmental and empathic fashion. Demonstrating that you value comments, questions and interactions from each learner and among all team members stimulates learning and assimilation of new material. You set the tone for exciting and stimulating learning on ward rounds or in small group sessions when you invite and value interactions among all group members. Improve group interaction by encouraging questions and comments. Ensure that learners know that all questions are good questions. Acknowledge and praise comments and questions, and use them as springboards for your own questions and comments, as you put them in perspective for the team. Further stimulate discussion by asking provocative questions and encouraging learners to take intellectual risks in proposing diagnostic hypotheses or solutions to problems. Formative evaluations help learners shape their learning. Summative evaluations communicate students' grades and reveal the knowledge or skills on which they need to continue working. To maximize the benefit of evaluations, schedule them in advance, and assure that your learners share the expectations, goals and objectives of the evaluations. When provided in a constructive and personal but non-judgmental manner, evaluations motivate learners to continue in their pursuit of knowledge and skills. Learners may not share your expectations or goals for a course or rotation, or may become side-tracked by other concerns, so do not omit mid-block or other formative evaluations that can redirect learners’ efforts. Clinical teaching often involves learners at differing educational levels. Identify learners’ levels and adjust your instructional strategies to meet their needs. (11, 12) Each level requires knowledge, structured experiences, emotional buy-in, reflection on action, role models, and learner-centered instruction for most effective progress toward the next levels. In this section, we address the differing needs of Novice Learners, Advanced Beginners, and Competent Residents, and discuss appropriate teaching strategies. For novice learners, highlight key pertinent data from their exams that help distinguish among diagnoses and encourage more intensive study of one or two competing hypotheses about diagnostic or treatment options. For advanced students and interns, require them to formulate differential diagnoses, help them to set priorities, and reinforce the meaning of context to the clinical problems. For increasingly competent residents, balance supervision and autonomy, helping them become aware of the emotional and clinical care consequences both of never asking for help or lacking the confidence to trust their own thinking and decisions. On their first clinical rotations, novice students typically perform H&Ps using a set of rules or templates. Regardless of the Chief Complaint, they methodically go through each item on the generic template. They have no capacity to focus the information gathering on the basis of a likely differential diagnosis and do not yet comprehend the big picture. When preparing a written H&P, pertinent positives and negatives remain scattered throughout the ROS rather than being discussed in the HPI. Each sign and symptom seems equally relevant. These students still have limited abilities to synthesize the myriad pieces of information into a unified summary. Using learned rules, they link the clinical data to their knowledge of the pathophysiology of disease. Point out meaningful diagnostic information in H/P. Highlight discriminating features with relative importance to diagnosis. Encourage reading of two or more diagnostic hypotheses to compare and contrast. The advanced beginner is typified by third and fourth year students through early internship who have experience with many clinical encounters. Advanced beginners use their experience to sort through rules and data to decide what is relevant. They begin to use pattern recognition to solve problems, seeing the big picture and how specific information relates to it. They begin to create their own personalized rules and “maxims” from meaningful prior experiences. At the beginning of the intern year, when advanced beginners are taking H&Ps, they begin to generate a differential diagnosis that drives data gathering in a more focused direction. Because they are capable of filtering information and focusing on the relevant, they are able to formulate a unified summary of the case. When writing notes, they can abstract the pertinent positives and negatives from the ROS and appropriately incorporate them into the HPI. Help identifying meaningful patterns in various situations. Work from the common to the uncommon. Reframe data, such as the Chief Complaint, into problem representations. Require the formulation of differential diagnosis. Be attentive to meaningful or situational aspects of the clinical presentations, to reinforce importance of context. Competent residents, usually approaching the end of residency, possess a wealth of clinical experience upon which to compare and contrast patient presentations. This provides competent clinicians with a perspective to determine important or ignored elements. They are able to see the big picture, using clinical reasoning tips from analytic to pattern recognition for solving common problems, but complex or uncommon problems require reliance on analytic reasoning. Because supervising residents must decide what plan to choose and when to choose it without being sure, every situation requires coping with uncertainty, which is both frightening and exhausting. It becomes an emotional roller coaster consisting of the pain of mistakes and elation of successes. Self-awareness allows managed emotional involvement, which advances development. Without self-awareness, this roller coaster may produce resistance to risk or responsibility, which leads to stagnation of development. Competent residents build on many clinical experiences as they near the end of residency, and recognize common illness patterns. They easily see the big picture. Because of their enlarged responsibilities, they see more consequences of their clinical decisions, which results in an emotional buy-in to learning. When they encounter new or unfamiliar problems, they methodically reason through each step of the case, sometimes successfully and sometimes getting stuck. They feel responsible for their decision-making process and are consciously aware of their own roles in contributing to the clinical outcomes. Hold competent learners accountable for decisions. Telling what to do prevents emotional buy-in. Expose the competent resident to the breadth and depth of problems to construct illness scripts (patterns). Reassure these residents that it ok to not know and to ask for help. This is important for all levels of learners, but perhaps more so for the competent resident who may feel that at this level they are expected to be masterful in all instances. In the following sections we discuss concepts and skills that promote active learning, in groups and with individual learners. At each level of training, you will be a role model for junior colleagues. Medical students, resident clinicians, clinical faculty and others will lead small groups of learners. Asking questions helps you understand learners’ level of understanding and their learning needs. At Hahnemann University Hospital in Philadelphia, Dr. Joseph Boselli is one of the most appreciated teachers. We present Dr. Boselli introducing himself at his first attending rounds or a rotation, and intern comments afterwards on why his teaching is effective. At each level of training, you will be a role model for junior colleagues. Maximize your effectiveness as a role model by strengthening positive personal qualities, clinical proficiency and teaching expertise. Be aware that you are a role model with learners at every level. Show that you value this role. Be explicit about what you are modeling, whenever possible. Help learners reflect on your modeling and what they learn from it. Implement a learner-centered approach to teaching. Engage in pertinent faculty development. Work to improve the institutional culture. Medical students, resident clinicians, clinical faculty and others will lead small groups of learners in rounds, case conferences, didactic informational sessions and other settings. We incorporate attitudes, educational principles, and skills into a summary of keys to effective small group teaching. For your assigned and scheduled teaching sessions, develop goals, divide the time into segments and follow your schedule. Always let participants know that you care about their learning. Be aware of elapsed time, devote time to a summary of the session and involve participants in debriefing your leadership and the session’s effectiveness. For your assigned and scheduled teaching sessions, develop goals, divide the time into segments and follow your schedule, use more than one teaching strategy, and have a written or digital handout. Planning improves the quality of learning sessions. Decide on your goals and objectives and write them down. Determine what materials and teaching methods you will use to achieve these goals and objectives. Provide a handout that summarizes essential points and might also serve as an outline for the session. Decide approximately how much time you will allot to each learning objective, and each segment of the session. Develop teaching strategies for each segment and vary teaching methods, not only to keep the session consistently interesting, but also to address varying learning styles of participants. For example, in planning a session around a patient with a particular problem, you might briefly introduce the topic, ask participants for their experiences in dealing with this problem and discuss those, highlight the important information to elicit from patients, do a brief patient interview and exam, discuss these findings and their implications, and then summarize essential learning points, referring to a brief handout or article. When teaching about healthcare relationships and communication skills such as discussion about advance directives, including time for succinct, focused role-plays can be illustrative and engaging. Always let participants know that you care about their learning. Use words and non-verbal communication to show that you welcome questions and comments. Acknowledge contributions and involve everyone. First impressions set the tone. When beginning a new group, take a few minutes to introduce yourself and invite each of the participants to do the same. You might ask them about their backgrounds and interests, to say something that nobody knows about them, what they are hoping for in this group, etc. Getting to know participants in a personal way helps set a positive learning climate. Communicate to participants that you care about them and their professional development, and that a key goal for your own work is to foster a stimulating, fun, and safe environment, with their help. Keep your session learner-centered. In addition to soliciting learners’ feedback on whether the session was learner centered, another gauge is this: if you leave thinking you really showed them how much you know, you may have missed responding to what they really needed to learn. An additional goal for group leaders is to help participants to share opinions, take intellectual risks and work together. Welcome questions, and invite other group members to respond to them before you do so. Involve the quiet members of the group, ("John, I would be interested in hearing your opinion,") and solicit contrary or minority opinions (“Shireen, from what you’ve said, I expect you might have another opinion on this- if so, would you share it with us?”) Acknowledge each learner’s contribution. Become a patient listener, ask simple questions that help learners refine their thinking, and notice what concerns they are not saying that may be relevant. Share your own insights and experiences only when they will advance the dialogue, never to show that you know the “right answer”. When working with a group of multi-level learners, such as a ward team, you might begin with a basic question and gradually move to advanced questions directed at the senior members. In that way, everyone can participate and know they have contributed to group learning. Observe and comment occasionally on non-verbal expressions of confusion, excitement or disinterest. When someone appears bored or uninterested, you might ask the learner his or her perspective on the issue. Your intervention can provoke useful adjustments to pace, tone, involvement or topic. Be aware of elapsed time, devote time to a summary of the session and involve participants in debriefing your leadership and the session’s effectiveness, and close at the designated time. As the session approaches closing time, take steps to solidify learning, reach closure, and plan for the next session. Ask participants to summarize the key lessons, and as you listen, paraphrase individual contributions. At times, you might ask each group member to say one thing they learned, or what they might apply in their clinical work in the next week. Identify learning issues for the next session, and if you haven’t done so already, ask a volunteer to look up the answers to questions or to make a brief presentation at the next session. Seek feedback about the session’s learner-centeredness and utility, and inquire about how the group and your leadership could be more effective. Asking questions helps you understand learners’ level of understanding and their learning needs. Skillful questions stimulate learners’ thinking and motivation to learn more. Group participants learn best when they are actively engaged in learning. Your questioning skills can be powerful in stimulating learning. When you engage learners in discussion through use of questions that expand their thinking and stimulate problem-solving and critical thinking, you promote active learning. Many obstacles can reduce the effectiveness of otherwise effective questioning strategies. Requiring a quick response to questions. Allow time for learners to think. Framing the question at a level of complexity beyond learners’ expected level of knowledge. Calibrate questions to fit your learners’ needs. Conveying lack of confidence that responses will adequately address the question. Show learners that you respect their competence. Praise successes, however small. Allowing only strong learners to respond to inquiries. Call on other learners when you have someone who is too quick. Ignoring the student’s fear of being wrong. Remind learners that “wrong, or off track” does not equate to “poor effort, or bad student”, and that learning from mistakes or poor thinking facilitates better understanding. Open-ended questions facilitate discussion and help you assess learners’ cognitive strategies and ability to generate and test hypotheses. Use increasingly closed-ended questions to involve learners who may be less facile with higher cognitive strategies. Directed questions help you guide learners’ thinking and stimulate problem-solving. Open-ended questions facilitate discussion, rather than seeking “right” answers, and help you assess learners’ cognitive strategies and ability to generate and test hypotheses. Open-ended questions possess characteristics that promote active learning. For example, they seldom have “correct” answers, they suggest that people may have differing answers and they require that responders consider more than one factor in developing answers. Additionally, the questioners may have some ideas but is asking for responses they might not have considered. The questioners wish for respondents to “think out loud” rather than parrot the “right” answer. What is the significance or relevance of a particular fact or observation? I’m always interested in hearing from those who might disagree with this notion. Is there someone with another take on this? Here is my idea, but I expect there are other ways to look at “x”. What are your thoughts? On rounds, your team sees a patient with HIV admitted for cough and shortness of breath. She has never been on HAART, her last CD4 count was 150, and she takes no medications at home. Use increasingly closed-ended questions to involve learners who may be less facile with higher cognitive strategies, and to help assess the knowledge base of learners. It may be helpful to build on your questions: start with simple concepts, then ask for further details, gradually leading learners to more complex thinking. This kind of exercise helps learners to expand their thinking. Your team later sees an elderly male admitted for dyspnea. He is found to have pulmonary congestion on chest x-ray and has rales on his pulmonary exam. Directed questions help you guide learners’ thinking and stimulate problem-solving. They model how teachers think critically about problems. What data would you need to...? How would your hypotheses be ranked if the patient were a …..instead of...? If a vital laboratory test was unavailable, what would you do instead? What important questions about this patient’s disease remain unanswered? The team’s next patient is a 67year old man with a long history of smoking and alcohol abuse who was admitted with dysphagia. Please click the video-button on the left and watch an attending clinician teaching a student after seeing a patient together. Which questioning skills did he use? How might he have used different kinds of questioning skills to be more effective in his teaching? At Hahnemann University Hospital in Philadelphia, Dr. Joseph Boselli is one of the most appreciated teachers. In this video, Dr. Boselli introduces himself at his first attending rounds of a rotation, and interns comment afterwards on why his teaching is effective. The complex dynamics of an encounter with a patient along with multiple levels of learners, each with individualized needs, is a challenge requiring attentiveness to respectfulness of both the patient and all learners. Bedside teaching necessitates careful attention to the patient’s comfort and dignity. Attend to structural elements of a bedside teaching session to maximize the learning benefit. Obtain permission from the patient in advance of the team’s arrival. Engage all team members in establishing both learning goals and a role for each team member to play. When you approach the bedside, introduce each team member and the purpose of your rounds. Attend to the patient’s comfort and to any communication barriers such as pain, privacy, or need to use the bathroom. Attend to all the learners and give them chances to ask questions or appreciate a physical finding, with the patient’s permission. Share some aspects of the “teacher” role with senior team members, both to demonstrate teamwork and to advance their skills. Avoid jargon, and engage the patient beyond the history and physical, perhaps by asking what she thinks about her doctors’ thoughts or what additional ideas she might have. Monitor the patient’s physical and emotional state, and cut short the session if the patient tires. If someone asks an uncomfortable or inappropriate question for that patient, take the opportunity to assure the patient that she is not required to discuss such an issue in front of the group, and remind her about your commitment to confidentiality. In front of the patient, as you conclude the visit, arrange for a team member to return later to clarify any questions or misunderstandings. Finally, solicit feedback on your teaching and role modeling so as to improve your own skills and jointly examine in more depth the impact of selected aspects of the encounter. No two sessions are alike. You teach beginners or more advanced learners, and mixed groups. Moods change, crises happen, new information becomes available. Teachers who value their work can continually improve. The stresses of clinical teaching may evoke inadvertent hurtful interactions with learners and other staff - even to the point of abusing them. Develop awareness of your “hot buttons” and choose to attempt to respond with empathy. Discussions with trusted colleagues and/or counseling may be very helpful. Clinical education that involves sick and often dying patients, families and other team members is by its nature stressful for learners and teachers. Sometimes you may realize that you left your learners hurt or bewildered, or receive feedback to that effect. Medical students who wish to “know everything” and “care for everyone” are easily hurt. Furthermore, outright abuse of students occurs, (25, 26) and sometimes we are the inadvertent abusers. Under pressure, for example on a busy ward service, we may be short with some learners, pimp others in a harsh and judgmental way, or deride learners’ “wrong” answers. This may have happened to you as a learner, and maybe you learned a lot from being humiliated, or felt it made you “stronger” in some way. You may think some “unmotivated” or “irresponsible” learners deserve such treatment. However, if you find yourself being hard on your learners, pause and take a closer look. Are unrelated problems diminishing your effectiveness with the learner? Sometimes it is in the relationship with you and the learner. Does the learner remind you of someone with whom you have had problems? Which of your “hot buttons” does the learner’s conduct (or lack of it) push, provoking your defensiveness or counterattack? At the very least, take the time to engage a shamed, humiliated, reactive, haughty or “bored” learner in a conversation that might not only clear the air but also enrich the educational experience for both of you. Take a close and frank look at your situation, and check your emotional temperature. Are you stressed, burning out, depressed or angry? Are you short with nurses or other staff members? Are your intimate relationships in trouble? If so, make time to speak with someone you trust and consider seeking counseling from a mental health professional. Few people engaged in clinical teaching escape the need to examine and “rewrite” an emotional story or script at some time or other so that we improve our well-being, balance and teaching interactions. Clinical teaching presents unique challenges to the educator. Often, both patient and learner require accurate diagnosis and intervention appropriate to the unique needs of each. The goals of clinical teaching focus on exposing the clinical reasoning process in order to assess the learner and improve their skills and knowledge, while insuring quality patient care. Effective teachers continuously improve their knowledge of the principles of education, curriculum development, and teaching techniques, reflect on their attitudes, practice relevant teaching skills, seek, welcome and act on constructive feedback, and cultivate self-awareness about your teaching practices. Clinical teaching at the patient’s bedside is an opportunity for effective role modeling, direct observation of learners in action and demonstration of clinical skills. Bedside teaching in small groups requires planning, facilitation skills, and use of discrete types of questions. Done well, clinical teaching fosters self-reflection and provides necessary feedback to promote self-directed learning which learners may employ for a lifetime of learning. As part of their doctoring curriculum, we ask interns and residents in the Drexel College of Medicine Internal Medicine program to identify principles that residents can use to enhance the learning environment for interns and medical students. This document shows the principles and strategies that residents have suggested. Residents and staff continously make revisions that have increased the utility of this guide. Be aware of how your attitudes influence your relationships with learners. What are your attitudes about your obligations as a resident and teacher? How committed are you to helping your interns and students learn and grow as professionals? How responsible are you for the interns’ learning and well-being? Which of your attitudes or qualities might get in the way of your being an effective teacher, or might enhance your teaching? Are you someone who takes an interest in others and cares about their growth and well-being? Do you mainly want to get the work done and get out as soon as possible? Are you a perfectionist; impatient; a forgiving person? Are you afraid of making mistakes, or admitting you don’t know something? What is the balance between encouraging learning and independence, and micromanaging to ensure that things get done well? How do you manage that balance for which learners? Some interns have had the experience of residents saying after they asked for help, “you’re a doctor now – figure it out!” How do you arrange your priorities between your own well-being, the interns’ well-being and patient care? Do you like your interns and students? All of these attitudes will affect relationships with your learners. Communication is key. Keep the lines of communication open- and positive- with your intern and students. If you are unhappy with how some things are going, it will be important to set aside time to discuss the issues and “clear the air,” since resentment undermines team dynamics. Similarly, if something you’ve done causes an attending or fellow to express dissatisfaction, it is important to find a time to discuss the issues with that person and express your perspective. Since you are an authority figure, your interns may feel reluctant to bring up issues or be assertive about their own needs. In all likelihood, they will need encouragement from you to talk about how things are going for them and what they need from you. Perfection is the enemy of the good. You don’t need to be perfect, or expect your interns to be perfect. Saying “I don’t know the answer to that, let’s look it up” or, “ I’m not comfortable managing this problem, let’s get a consult” can be reassuring to your team members and set a good example. Provide positive energy! Your positive attitude and enthusiasm can make a real difference in the team. You are a role model and a mentor for your team. All your interaction with patients, colleagues and staff set an example of professional behavior. Also, you went through a lot during your internship, and the lessons that you can pass on to your interns can be a real help to them. As you know, internship is stressful. Interns will make mistakes. If you are supportive, positive and understanding, and do not ignore relationship issues, your attitude will reduce anxiety and help the intern learn. Be welcoming of questions and requests for help. Interns may be reluctant to ask for help. If you let interns know you are there to support them, and to please ask questions if they are not sure of something, you will foster their growth, make the team more effective and better care for the team’s patients. Look for things that are going right, and compliment your interns for them, in addition to looking for things that are wrong and correcting them for the future, . Remember not to talk disparagingly about other house staff. Your gossiping sets an example for others on the team to gossip as well and generally creates a negative tone. Also, gossiping can contribute to creating a false impression about an intern that could follow them for a long time. You are contributing to the general culture of learning in the residency. Is your contribution a positive one? Monitor your own feelings and mood. If you are irritable and easily annoyed, this will create a negative learning environment. Many house staff become burnt out or depressed sometime during residency and this contributes to negative attitudes and irritability. If you are feeling down, talk with a colleague or consider getting help. If you are having a stressful day or are feeling upset or short-tempered about issues that are unrelated to your team members, share that with the team so they won’t think that your mood is related to them, and maybe they can be helpful to you on that day. You won’t be able to be effective with patients and your interns if you don’t take care of yourself first.Please be sensitive to your interns’ emotional state. Interns are perhaps more prone to burnout and depression than residents. If you notice that your intern is down, or dragging, ask what’s going on, ask if you can help and try to help. Think about what’s best for the patient, not about yourself, and you won’t go wrong. This seems like an obvious principle but sometimes it gets lost when a fellow or attending gets annoyed at you when you call in the middle of the night. You or your intern might feel intimidated to call because of a superior’s negative reputation, or you may not want to ask a question for fear of being criticized or that others might think less of you. If you can keep the perspective that we’re here for patients, and whatever the potential blows to our self-esteem, they are little when compared to the patients’ needs for us to care for them, you’ll do what is right. At the beginning of every rotation, discuss and clarify with your interns and students the goals and expectations for the rotation. It can be helpful to set high expectations. Be clear on the details of everyone’s roles, including your own. As a resident, you are the captain of your team and need to acknowledge that role. At the end of the day you are responsible. You do have more practical knowledge and experience, and have much to offer. So don’t play down your leadership role. Tell interns to call you right away if a patient takes a turn for the worse. Let the interns know you have their backs, and will catch them if they fall. Talk to interns and students about how to organize and prioritize their days. Talk to them about not being shy about asking for help, and when to ask for help. Ask them about their system and make suggestions to improve it. Help interns understand the “long view” of the goals of the rotation, since interns tend to get caught up in the minutia of all the tasks that need to get addressed each day and can lose perspective on their general patient care and learning goals. Tell interns the rules about new admissions. (For example, when is it ok for triage to give you new admits, etc.) Consider having sub-I’s work up new admits as long as they are not critically ill and then go over the workup with them. Be open to suggestions. Look at the first day as a team building exercise. Get to know each other. This sets the tone for the whole rotation. What are their expectations and learning goals for this rotation? How can you help them achieve those goals? Ask your interns and students how they learn most effectively. Do they learn best with a lot of guidance, or do they want to work independently and call you when they need you? How can you structure the work so that students are integral members of the team? Students need specific responsibilities, expectations and opportunities for feedback. They can be important contributing members of the team – ask them about what worked best for them on previous rotations. Come up with an explicit agreement about how you and the interns and students will work together during the month. Work as a group. If you do this and share the work, there will be more time for teaching (and for much needed breaks). Help interns manage their time and work more efficiently. Help interns prioritize tasks in the beginning of the year since everything seems important in the beginning. Consider setting goals at the beginning of the day. In the first months, ask the interns how many notes they can write by 9:30 – 10:00AM (depending on the service) and call them at 9:30 or 10:00 asking, “who have you seen and what do you need me to do?” On very busy services, some residents feel it’s a good strategy to offer to see the sickest patients and new admissions, and have the interns see the rest. It is a good idea in the first month or two of the year to round with the intern. Teach them how to gather information for the notes (ie, vitals, labs, studies, etc); show them interesting findings on exam; show them how to write the notes. Do this every day for a week, or until the interns feel confident seeing patients on their own. If your intern struggles to get through the patient notes, go over some of the patients and their notes and make concrete suggestions that can help the intern be more efficient. Pre-round with your students and help them formulate their presentations to the attendings since faculty tend to grade students on how well they present. Consider running the patient list with the intern and students three times a day – at the beginning of the day, after attending rounds since the attending always has some suggestions, and at end of the day. At the end of the day, consider sitting down, going over what we all did today, what do we need to accomplish tomorrow? What did we do well? What do we need to work on to do better? Make the end of the day get-together a time of support and self reflection. Be available, and make sure your interns know you are available. Show up when needed. Don’t teach over the phone. Plan for mid-rotation informal feedback, and articulate what that feedback will cover. (This feedback session will be something like going to coffee with your intern(s), asking them how things are going, are they accomplishing their stated goals, asking how can we do better, what could I as the resident do differently that will help the team, etc?) Also, you might consider giving your students feedback mid-block and asking them what they suggest you might do differently in the second half of the block to help their learning. You are responsible for the care of patients on your team. This means that you should have a goal of seeing every patient on your team every day! For the sicker patients, you need to spend time and make sure all bases are covered. For the less sick patients, you can spend less time. You should review all patients’ labs every day. Set aside learning time, apart from attending rounds. Every day, pick something from your patient panel: a physical finding, a feature of a patient’s disease that you can explain more fully. These sessions should last a few minutes to a maximum of 15 – 20 minutes. At the beginning of the year, a good teaching session would be “common calls that an intern will get, and how to respond to them.” (This session would also be good at the end of the year for the fourth year students.) Also, you can assign students to look up basic topics and give a 5-minute presentation on them the next day. For specialty rotations, like at the beginning of MICU, CCU, or oncology rotations, organize a 20 minute orientation with a fellow for the team. Make it a short overview of what is expected and perhaps create handouts of essentials unique to that specialty – adjusting vent settings in MICU, interpretation of swan readings and how to make management adjustments based on these in the CCU, how to respond to a febrile neutropenic patient in oncology, etc. Consider occasionally bringing coffee for your post-call interns or showing other concrete signs of support. Periodically check in with your intern to see how he/she is managing emotionally. Your encouragement and support will be reassuring and help your interns have a positive attitude. Pay attention to communication and relationsips with other patient care team members . You can work at improving a variety of communication, like how to respond to “suggestions” from nursing staff without being confrontational. Listen to nurses and be respectful in talking with them. Work at being assertive and respectful at the same time. Never get to the point of yelling at a nurse or colleague. As a sister team resident, you should help your post call intern. you should be sure that both of your work is done – help your post call intern when she or he needs it - before you leave the hospital on weekends. Elnicki DM, Cooper A. Medical students' perceptions of the elements of effective inpatient teaching by attending clinicians and housestaff. J Gen Intern Med 2005;20:635-9. Elnicki DM, Kolarik R, Bardella I. Third-year medical students' perceptions of effective teaching behaviors in a multidisciplinary ambulatory clerkship. Acad Med 2003;78:815-9. Wear D, Kokinova M, Keck-McNulty C, Aultman J. Pimping: perspectives of 4th year medical students. Teach Learn Med 2005;17:184-91. Schindler BA, Novack DH, Cohen DG et al. The Impact of the Changing Health Care Environment on the Health and Well-Being of Faculty at Four Medical Schools. Acad Med 2006;81:27-34. Novack D, Suchman A, Clark W, et. al.. Calibrating the clinician. Personal awareness and effective patient care. Working Group on Promoting Clinician Personal Awareness, American Academy on Clinician and Patient. JAMA 1997;278:502-9. Peabody FW. The care of the patient. JAMA 1927;88:877 - 882. Novack DH, Dube C, Goldstein MG. Teaching medical interviewing. A basic course on interviewing and the clinician-patient relationship. Arch Intern Med 1992;152:1814-20. Branch WT, Jr., Paranjape A. Feedback and reflection: teaching methods for clinical settings. Acad Med 2002;77:1185-8. Shanafelt TD, Bradley KA, Wipf JE, Back AL. Burnout and self-reported patient care in an internal medicine residency program. Ann Intern Med 2002;136:358-67. Carraccio CL, Benson BJ, Nixon LJ, Derstine PL. From the educational bench to the clinical bedside: translating the Dreyfus developmental model to the learning of clinical skills. Acad Med 2008;83:761-7. Dreyfus SE. The Five-Stage Model of Adult Skill Acquisition. Bulletin of Science, Technology & Society 2004;24:177-181. Wright SM, Kern DE, Kolodner K, Howard DM, Brancati FL. Attributes of excellent attending-clinician role models. N Engl J Med 1998;339:1986-93. Skeff KM, Mutha S. Role models--guiding the future of medicine. N Engl J Med 1998;339:2015-7. Cruess SR, Cruess RL, Steinert Y. Role modeling--making the most of a powerful teaching strategy. BMJ 2008;336:718-21. Beckman TJ. Lessons learned from a peer review of bedside teaching. Acad Med 2004;79:343-6. Kroenke K, Omori DM, Landry FJ, Lucey CR. Bedside teaching. South Med J 1997;90:1069-74. LaCombe MA. On bedside teaching. Ann Intern Med 1997;126:217-20. Schwenk TL, Whitman N. “Residents as Teachers: A Guide to Educational Practice.” 2nd ed: The University of Utah; 1993:p 47. Whitman N, Schwenk TL. “The Clinician as Teacher.” 2nd ed: Whitman Associates; 2007 p 168. Azer SA. The qualities of a good teacher: how can they be acquired and sustained? J R Soc Med 2005;98:67-9. Pinsky LE, Monson D, Irby DM. How Excellent Teachers Are Made: Reflecting on Success to Improve Teaching. Adv Health Sci Educ Theory Pract 1998;3:207-215. Roop SA, Pangaro L. Effect of clinical teaching on student performance during a medicine clerkship. Am J Med 2001;110:205-9. Neher JO, Gordon KC, Meyer B, Stevens N. A five-step "microskills" model of clinical teaching. J Am Board Fam Pract 1992;5:419-24. Elnicki DM, Curry RH, Fagan M et al. Medical students' perspectives on and responses to abuse during the internal medicine clerkship. Teach Learn Med 2002;14:92-7. Elnicki DM, Linger B, Asch E et al. Patterns of medical student abuse during the internal medicine clerkship: perspectives of students at 11 medical schools. Acad Med 1999;74:S99-101. Allison Ferris M.D., Joseph Boselli M.D., Eric Vogel M.D.